1999 was the year of official Resident Evil game announcements and showings... Code Veronica, Resident Evil 3, Gun Survivor, and Zero all made their first proper display during the year. Along with this Resident Evil 2 made a reshowing for Dreamcast and Nintendo 64 and finally Virgin Interactive announced that the original Resident Evil was to be ported to the Game Boy Color by the start of 2000 by UK developer HotGen. Of course 2000 came and the game was constantly delayed until Capcom and Virgin both announced that the project had been scrapped as it was not living up to the standard that they were wanting out of it. People were slightly disappointed by the events surrounding the ports cancellation as it had looked well enough for the platform and reports of early demos had been positive enough considering the limits set by the Game Boy, including lack of buttons, limited color display, and graphical display. By early 2001 however it seemed Virgin hadn't been so happy to just quit creating a Resident Evil title for a portable system. Tiger had proven that it could be done with Resident Evil 2 on their Game.com but that the translation may have to suffer for the chances. However by this time people expected the next title to appear on the Game Boy Advance, and perhaps be a restart of the previously scrapped port project using the new technology to enhance the game and fix the problems Capcom and Virgin both had with the Game Boy Color version. As we were all to find out both of these facts were to be incorrect. 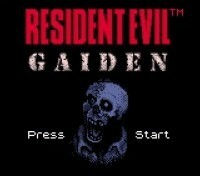 Instead it was revealed that the title would still be on the Game Boy Color and would be an original title named 'Resident Evil Gaiden' developed together by Virgin Interactive and another UK developer called M4. Capcom seemed willing enough to give the go ahead and Virgin said the game would be out in European stores, at least, by the end of year. Over a month before it's UK release, in early November, the game illegally began to appear online, and it wasn't long before it spread like a wildfire online. At the same time I posted my first impressions of the game which you'll also find in this section (under "Impressions" of course). 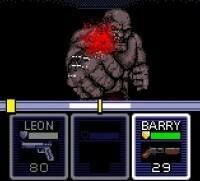 When the game was released in December in the UK reviews by Nintendo magazines were fairly positive citing the length in gameplay and the fact that M4 had managed to bring the Resident Evil package to portable format near flawlessly. Sadly both the Japanese release of Biohazard Gaiden and the US release of Resident Evil Gaiden trailed those of the Remake's local releases on Gamecube in 2002 and effected both sales and reviews. Like most titles Gaiden has both it's fans and it's haters, especially those trying to understand where it fits in the storyline. As far as I understand it in the legacy of games, videogames titled "Something Series Gaiden" seem to be nothing more than unrelated side stories, and it seems Resident Evil Gaiden does indeed fit this mold. Perhaps you should check it out and see what you have to think about portable Evil.